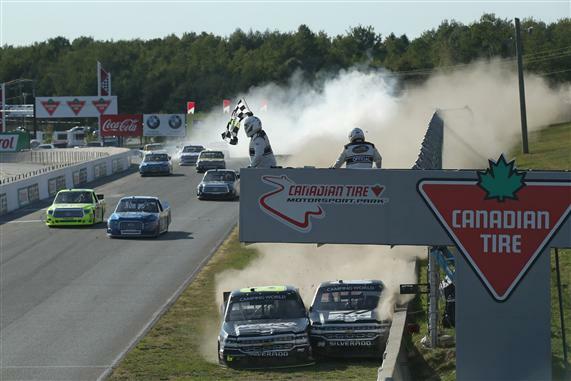 Canadian Tire Motorsport Park on September 4, 2016 in Bowmanville, Canada. The race’s pole winner, eighteen-year-young, Cole Custer, was leading in Turn nine on the 2.459-mile Canadian Tire Motorsports Park road course when the barely older, nineteen-year-old John Hunter Nemechek, tapped the rear of Custer’s Haas Automation Chevrolet. Although he was knocked loose, Custer recovered to lead into Turn ten. Not to be denied, Nemechek, hit Custer again at the exit of the corner and drove both trucks into the guardrail heading for the checkered flag. Nemechek kept his foot in the gas and Custer’s truck pinned against the wall until he reached the finish line. The way the trucks were smashed together, Nemechek was slightly ahead of Custer when the two got there. Some, the ‘Rubbin is Racing’ genre applauded as this action as good exciting racing. NRM must agree that the finish was rousing. However, it really did not represent anything related to racing. However, after viewing the video, it is clear that on the event’s final restart, Custer’s focus secured him a good jump and he raced away gapping second and third. Nemechek's lackluster restart made it necessary to retake second place from Spencer Gallagher, losing him precious real estate. However, as Custer gathered the white flag as the leader, Nemechek, whose truck was fast, passed Gallagher and rushed with reckless abandon to Custer’s back bumper. "There's been a lot of attention toward the finish and towards me on social media but like we said, we're happy that we got the win and we won't take that away from anything," Nemechek said. "But if the circumstances of us going in the grass hadn't happened, they wouldn't be talking about the finish. That's the only thing you'd like to go back and change, is not ending up in the grass." Of course Custer had a different view. "I knew he was going to drive me dirty all day no matter what. That last lap, I was trying not to make any mistakes and he pushed it a bit farther. That’s what you do when you’re in second. He got pretty close to us and then the last couple corners, I knew he was probably going to hit us a little bit — I’m fine with a little hitting but when it’s three times putting you in the wall and off the track, that’s a different thing." Hmmm, that was pretty dirty! Not that hard to pass someone clean in that corner bud. Unfortunately, NASCAR typically does not penalize drivers who crash a competitor while racing for the lead. "It was certainly an aggressive move," O'Donnell said. "We've always said that NASCAR is a contact sport and when drivers are racing, we expect that there could be contact. In this case, we said it was a very aggressive move, but made the determination at the race track to declare John Hunter the race winner." In fact, neither driver was penalized for their on-track negatively antagonistic behavior. In this writer’s humble opinion; while it is good for the “ratings” I feels cheated by a finish awarded to the driver willing to drive completely through the leader. NASCAR’s stance of no action taken for either the wreck John Hunter Nemechek caused to vandalize the lead from Cole Custer, nor for the after race tackle Custer made in retaliation after the race is an unadvised step backwards to “boys have at it.” Again great for ratings but detrimental to actual competitive racing based on skill. NASCAR Race Mom will probably have more Custer / Nemechek drama to prose in the near future – as these boys will probably “have at it” before the conclusion of the inaugural Truck Series Chase.